Wall Street's short-term focus is causing analysts to overlook Nutanix's exceptional growth prospects. Here's what they're missing. Shareholders of enterprise cloud provider Nutanix (NASDAQ:NTNX) have had a bumpy ride this year. The stock has been up as much as 80%, but after a disappointing fourth quarter earnings report (and some market turmoil), Nutanix has fallen more than 40% from its highs. Investors were spooked by slowing year-over-year revenue growth during the fourth quarter of 2018. Nutanix grew revenue 20% year-over-year, a substantial slow down from nearly 41% year-over-year revenue growth last quarter. However, management is intentionally eliminating the company's least profitable hardware revenue as they transition to a higher margin software and subscription revenue model. Wall Street's short term focus on quarterly revenue growth is causing analysts to miss Nutanix's hidden software and subscription growth, its position as a leader in the enterprise cloud market, and its growing federal business. 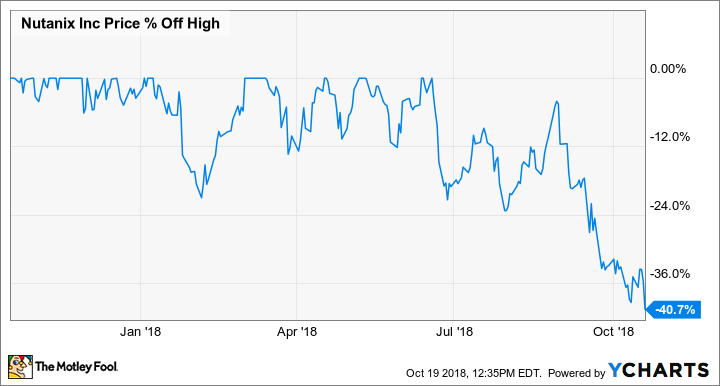 This sell-off is the perfect opportunity for investors to buckle in, pull their shoulder restraints down extra tight, and ride this roller coaster to new heights. To understand the state of Nutanix's business, let's review how the company has evolved over the last 7 years. From 2011 to 2017, Nutanix sold most of its software as a package with its own branded hardware, which it sold at zero-margin. As an unknown company, this strategy made sense for Nutanix. Nutanix was able to distinguish itself with an Apple-like focus on hardware design and customer experience, while emerging as a leader in cloud management software. However, maintaining tight control over hardware and recognizing hardware revenue at zero-margin had two negative effects. It limited management's ability to focus on growing software sales and masked Nutanix's stellar software margins. At the beginning of fiscal 2018, Nutanix to action to remedy the negative effects of maintaining complete control over its hardware and selling it at zero margin. Starting in the first quarter, Nutanix allowed legacy hardware manufacturers to sell its branded hardware directly. This decision eliminated more than 80% of Nutanix's zero-margin pass-through hardware revenue, resulting in 47% year-over-year growth in software and support revenue and gross margins improving to 68% versus 63% in fiscal 2017. According to management's first quarter 2019 guidance, pass-through hardware billings will be 5% to 6% of total billings versus 26% a year ago. Software and support billings are projected to grow 50% to 55% year-over-year and gross margins are expected to be 78%, up from 62% a year ago. If Nutanix delivers on these numbers, investors are poised to see significant upside as it blows away analyst's depressed expectations. Hyperconverged infrastructure (HCI) offers businesses the capability to integrate resources from rented public cloud servers and their on-premise private cloud datacenters into one seamless enterprise cloud. This allows businesses to run specific applications on the datacenters they own for compliance or privacy reasons while leveraging the scalability public clouds offer for more resource intensive applications. This optionality appears to have struck a cord with businesses, because demand for HCI is surging. A report by International Data Corporation (IDC) measured worldwide HCI system sales growth of 78% in the second quarter of 2018. According to the IDC report, systems running Nutanix's hyperconverged software represented $497.7 million in total second quarter 2018 vendor revenue, or 34.2% market share. . VMware challenged Nutanix for the lead with 34.1% market share. Nutanix and VMware also face competition from Dell, Cisco, and HPE, with each owning around 5% market share. However, Nutanix and VMware have taken market share over the last year. The HCI market is enjoying 78% growth and gross margins over 80%, which will certainly attract competition, but Nutanix's new software focus puts the company in position to continue meeting the growing demand and maintain its position as a top dog in a growing industry. A federal business that's picking up steam. The beauty of the HCI market is that both the private and public sector benefit from the hybrid cloud model. In fact, research firm Gartner expects U.S. federal cloud spending to more than double over the next four years. Fortunately, Nutanix is strategically positioned to take advantage of that growth. Nutanix offers federal entities the same one-click Enterprise Cloud Management Operating System that its corporate customers rave about. Nutanix's Enterprise Cloud OS gives federal customers the flexibility to select their choice of virtualization vendor from VMware, Citrix, Microsoft, Nutanix, and others to make their computing resources available on their enterprise cloud. A good analogy is personal computing. This is similar to users being able to mix and match their operating systems with multiple types of hardware and software to meet their unique computing needs. This is where it get's exciting for Nutanix. During 2017, Nutanix grew its federal customer base by nearly 45% and federal Enterprise Cloud OS customers used Nutanix's virtualization option (named AHV) (instead of its competitors) on 74% of all nodes sold. This is more than double the 30 percent adoption by Nutanix's worldwide customer base. With Nutanix's land and expand model, these customers should continue to spend more and deepen their relationship within the Nutanix product ecosystem as each year passes. Management doesn't break out the total size of Nutanix's federal business, but judging by the company's most recent quarter, it has a meaningful impact on revenue. During the fourth quarter of 2018, Nutanix landed five federal deals worth over $1 million including its largest deal ever, worth more than $20 million. Nutanix's federal business should gain momentum as it continues to expand its government offerings. Nutanix is continuing to introduce new products to address its federal customers. For example, Frame, the company's recently acquired "cloud-based Windows desktop and application delivery service," is currently working its way through the federal regulatory approval process, achieving its most recent milestone on September 25. As Frame and other Nutanix offerings clear the authorization process, Nutanix can add to its line of federal offerings. CFO Duston Williams expects Nutanix's federal business to continue to see larger and larger deals, specifically during the first quarter of 2019 due to the tendency for increased first quarter federal spending. Buying opportunity or falling knife? Nutanix's stock price has been volatile and competition is heating up. However, the company is operating exceptionally well and management is focused on the long term. For patient investors looking to start or add to a position, this sell-off is a buying opportunity.